MIKE WEST photos Lil Mikey is 20 hands tall, 26 years old and is a Belgian draft. Mikey worked as a carriage horse in Key West, FL his entire life, until he was no longer needed or wanted and turned out for a year with no care. Are you a horse fan? Then you need to add Saturday, Nov.21 to your calendar. Ferrell Hollow Farm, senior horse sanctuary, will have a rare open house on that day from 10 a.m. to 3 p.m. The farm is located at 5323 Ferrell Hollow Road, Readyville, 37149. "Our mission is to advocate and care for special needs senior horses that require a permanent sanctuary setting, who are not afforded adequate care if left in their current situation," said Cindy Daigre, executive director. 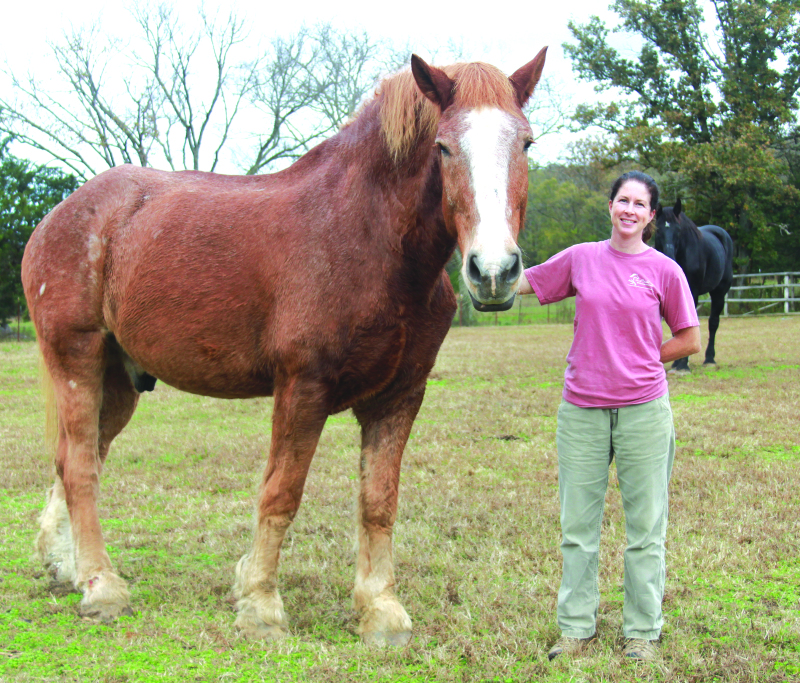 Most of the horses at Ferrell Hollow Farm are big, draft horses rescued from the kill pen. "We have 14 horses here and that's just about all I can take care of," Daigre said. Many of them were draft horses and others were carriage horses. One horse, a big Clydesdale named Liz, was a victim of the PMU industry, which produces Premarin, a drug prescribed to women as a hormone replacement therapy. Premarin's name is a shortened version of PREgant MAres uRINE. "Horses like Liz are impregnated and placed in a stall for eight months to collect every drop of urine," Cindy explained. They are then released to have their colt, only to be impregnated again in a cycle that only ends with the horse's death. "It's just back and forth, back and forth," she said. This process left Liz fearful of people, Cindy said. "For me to touch her was a no-no," she explained. Eventually, Liz let Cindy touch her, but the big Clydesdale is still fearful of most people. "She's very intelligent, she likes to look at visitors, but she keeps her distance," she said. Liz is compatriots with a big, white Percheron which is blind. With a little TLC, the Percheron has gained a good feel for the big paddock where he stays with Liz much of the day. "Dealing with a blind horse was a learning experience for me. We kept him fairly confined at first, but he began to learn the area with only an occasional mishap," Cindy said, laughing as Liz tried to hide behind the big white horse at the approach of a photographer. Two of the 14 horses at Ferrell Hollow Farm are blind which might present a problem in a traditional setting. "But we manage to improve the quality of their lives," she said. Most of the horses at Ferrell Hollow are "elderly" with the oldest more than 30 years old. Most of them were acquired out of state. "All of them are very laid back and gentle," she said. Some of them have had a hard life and were injured doing heavy work. Many of them wear padded, rubber shoes to reduce the strain of their hooves. Others have jaw and tooth troubles. Some arrive at the farm emaciated, just skin and bones. "Many of them can't eat hay, so we feed them milled grain that has been soaked," Cindy explained. "Many of them have multiple issues and you are not able to fix all their problems. The idea is to make them fat and happy for the rest of their lives." Operating Ferrell Hollow Farms costs about $75,000 a year ... all privately funded. "The average cost is about $500 a month, some $750. We don't have any grant money at all." Much of the funding comes from donations. The Fall Fun at the Sanctuary event on Saturday, Nov. 21 is a fun-raiser and is designed to increase public awareness. "It is a free event open to the whole family, however, please leave pets at home," Cindy said.